The alarm rang out at 5:30 am. It was an early start. We rushed through the last few tasks on the “Do Not Forget” list, left a list of phone numbers for our house sitter and loaded up the contents of the fridge in the back of the ute. I fumbled with the keys as we locked up the house. At last, at 7 am we were on our way. Three utes were already parked together on the driveway when we pulled up. We were the last to arrive. Everyone was milling around laughing. This is Deans Marsh and I should not have been surprised to see that we were not allowed to slip away quietly without a sound. Our friends, Dom and Suzanne had dragged themselves out of their warm bed to see us off. 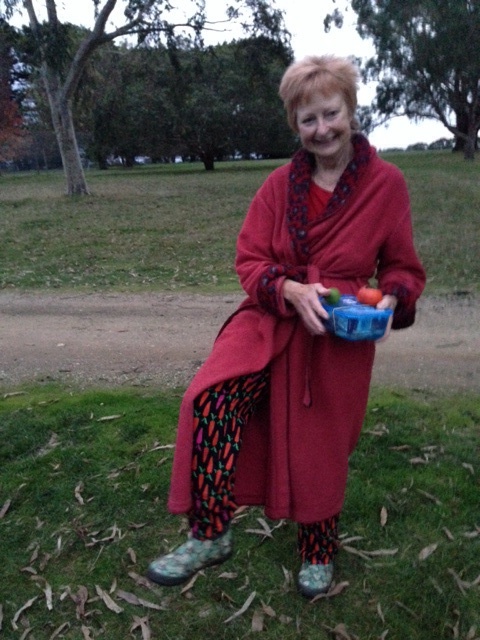 Dom handed out an eclectic survival package of essentials to each couple (shower cap, chocolate, elastic bands, fly strip, etc), while Suzanne in her pyjamas, dressing gown and slippers pressed a fresh persimmon and lime from their garden into our hands. “Lime for the Margaritas and a persimmon for your morning tea,” she whispered. We all stood by our cars for a formal photo, said our last goodbyes and we were off. “Channel 16”, called Olive as we pulled out of the gateway. UHF radios were switched on and we carried out our first radio checks. Howard and Beryl naturally took the lead, while Malcolm and Olive waited until Brett and Christine, Richard and I had followed before bringing up the rear. It was if the old hands were gently herding us along the way. I’m slightly ashamed to admit that although I have travelled up the East Coast of Australia, I have never visited Perth in the West, or even Adelaide, the state capital of South Australia. Everywhere we go from now on will be a totally new experience for me. Along the way I marvelled at the Aussie town names. Who came up with a name like Willalooka? A township with timeless stone buildings turned out to be called Hexham, named after a well known Northumberland village, who knows why? Every town along the way celebrates or remembers something, the national collection of eucalypts, the Ansett museum, the famous Dergholm guinea flower. Even the smallest town has something unique about it, some small source of civic pride. In Coonalbryn, it is a roadside Belgian Waffle stall, selling authentic waffles made the way they make them back home in Liege. Beryl chatted for a while to the Belgian stallholder learning when and how he came to be a Belgian selling waffles in a small town in Australia. Having made her contribution to Belgo-Australian relations, she then made her way back across the busy road with a plate loaded high with waffles, strawberries and cream. The waffles were soon devoured and I believe they were deemed worthy of both Belgian and Coonalbryn pride. There were many large stations farming this country in the early days of settlement. Along the way, we spotted an old Western District homestead that had been rebuilt for tourists and was well worth a visit on another trip. “They even have their own lock up prison cell there”, called out Olive on the radio. “They needed to have somewhere to put the farmhands when they got out of control”. “You’d better get Malcolm to build you one at home”, came the quick reply. The countryside was green and lush as we drove through Western Victoria and it was easy to see why this has always been prime cattle and sheep country. As we drove into South Australia, the land grew flatter. Vineyards stretched as far as the eye could see, their golden brown autumn colours muted in the afternoon light. Finally, the flat land gave way to the beautiful rolling Adelaide hills and we drove into the busy town of Hahndorf, the oldest German settlement in Australia. Hahndorf makes the most of its German origins with Apfelstrudel, Bratwurst and Weizenbier all on offer. It’s easy to see why the town is so busy with tourists on a warm Autumn weekend. We drove almost 700 km today, taking the best part of 9 hours to reach Hahndorf. It was a long day and it is now drawing to a close. As I write this post for you, dear reader, it helps me to reflect on the day and what will I take from it. Today, passing through all those small, proud towns, it reminds me how it is truly human nature to love the place you live, to find something grand and memorable in it – something to celebrate with each other and with travellers passing through. 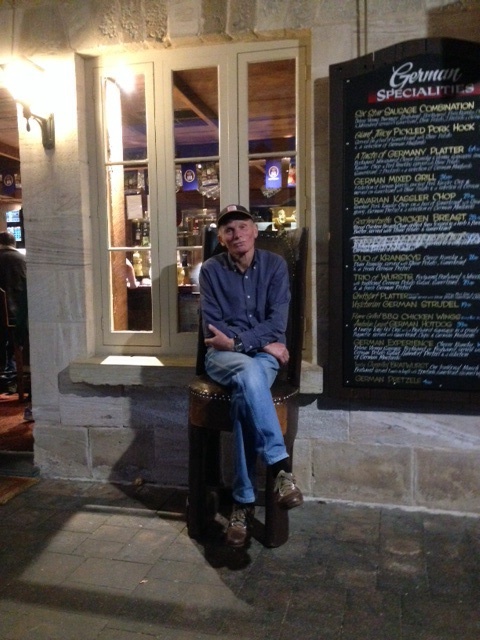 This entry was posted in On the road and tagged Australia, Travel on 17/05/2014 by Deb McSephney. Good luck and happy trails!! 🙂 It sounds like a wonderful trip of a lifetime! Thank you for dropping by and joining our convoy of virtual travellers. Great trip! Malcolm and Lindy live about 20 minutes from Hahndorf!